Are you surprised to see a flag here? Well, this is because I decided to write my blog in English mainly. But, many of my friends asked me to translate the recipes in Italian and Croatian. So, here and in future posts, when you see flags it means you can read the recipe in those two languages as well. I know, strawberries are not a big news anymore, you can find them all year round, but still there's something about them appearing in spring, and I can't resist their sweet smell. Came home with 2 kilos yesterday, and soon started thinking what I could do with them. Didn't take me long to come up with an idea of making a strudel. 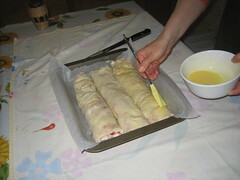 Strudel is a typical Austrian pie, it means "a swirl" in German, and the apple strudel is probably the most famous one. In Croatia, and even more in Bosnia, it is made with a whole variety of fillings - sweet (apples, cherries, pumpkin, chocolate), as well as savory (fresh cheese, cheese and spinac, potatoes, ground meat) - if you are travelling to Bosnia, never miss to try "Burek" or "Pita" there. I always make my own phyllo for strudel, so I'll start with that. Ingredients: 250 g flour, 3 tablespoons of oil (whatever you like - olive, sunflower...), a pinch of salt and 150 ml lukewarm water (or mix 100 ml water and 50 ml milk). 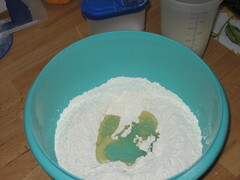 Put flour, salt and oil in a bowl, start stirring and adding water until you have taken in all the flour. 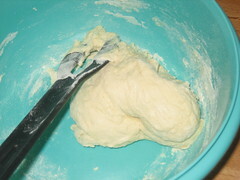 Soft, sticky dough will start forming. 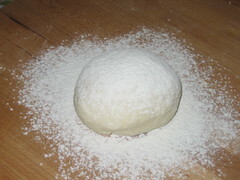 Turn it on a floured kneading board, and knead, adding a bit more flour if necessary until a soft, elastic ball is formed. The longer you knead it, the more elastic will it become. Sprinkle it with flour, cover and let it rest for 30 minutes at room temperature. It's very imopartant to leave the dough rest. 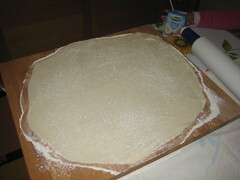 Roll the dough out with a rolling pin as thin as you can. 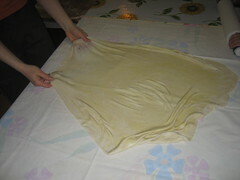 Start pulling the dough in all directions by placing your hands underneath - gently, it's elastic but will break easily, althogh that's not a big problem. When I was a kid, this was my favourite part and I always insisted on helping my mother, just like my daughter is doing now. You can see how thin it is, and yet so soft and elastic. 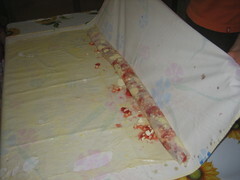 With a knife, or simply pulling away with your hands, remove the thick edge all around. 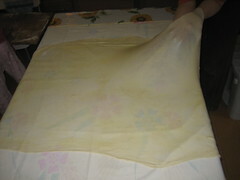 And now, your phyllo is ready to be filled. First of all, wash and clean strawberries. Peel the apple and remove the core. Cut both into small cubes and mix with half of the sugar. Mix ricotta with the rest of the sugar, vanilla and 2/3 of the slightly beaten egg. Put ricotta on top of the fruit. Oh, look, there's a hole!!! This is Francesca's favourite part (Can I help? Can I, please?). 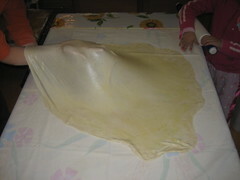 Lift the edge and flipp it over the filling. 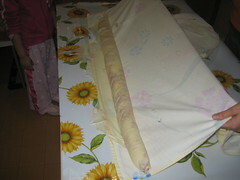 Lifting the tablecloth, roll the strudel into a "sausage". Cut the strudel to fit your baking tin, I also lined the bottom with baking paper, because the fruit filling tends to leak out and makes it difficult to remove the strudel from the tin later. Remember 1/3 of the beaten egg you put aside earlier? 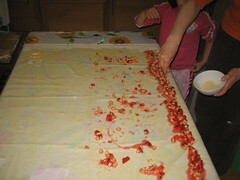 Add 1 tblspoon of milk to it and brush your strudel. If your oven is hot enough (180°C), put the strudel in and bake for about 35-40 minutes, or however until its nice light brown in colour. Now comes the difficult part. Wait until it's cold, cut and eat. But I assure you, it's even better the day after. -vanilin šećer ili 1 žličica ekstrakta vanilije. Pripremite vučeno tijesto i ostavite da odmara 30 minuta (Pogledajte slike za detalje). Operite jagode, uklonite peteljke i narežite na kockice. Ogulite jabuku i narežite na kockice. Pomiješajte jagode i jabuke s polovicom šećera (100 g). Lagano razmutite jaje pa otprilike 2/3 dodajte dobro ocijeđenom siru, dodajte ostatak šećera i vaniliju, pa dobro izmiješajte. Razvucite tijesto i rasporedite voće duž dulje strane, pospite ga mrvicama. Rasporedite sir po voću. Poprskajte uljem ili rastopljenim maslacem. Nožem odrežite debeli rub tijesta, pa smotajte. Ostatku razmućenog jajeta dodajte 1 žlicu mlijeka pa time premažite savijaču. Stavite u nauljen lim i pecite oko 35-40 minuta u pećnici zagrijanoj na 180°C. Po želji pospite mljevenim šećerom prije posluživanja. Savijača će biti još bolja sutradan. In una ciotola, mettete la farina setacciata, aggiungete l'olio, sale e acqua, mescolate fino ad incorporare tutta la farina, formando un impasto omogeneo. Trasferite tutto su una spianatoia infarinata, e lavorate a lungo aggiungendo altra farina ogni volta che la sfoglia inizia ad appiccicarsi alle mani. Piu a lungo lavorate la sfoglia piu sarà elastica dopo. Formate una palla, cospargete di farina e lasciate riposare coperta per 30 minuti. Nel frattempo, tagliate la frutta a dadini e mescolatela con metà dello zucchero. Aggiungete il resto dello zucchero alla ricotta insieme alla vanillina e 2/3 dell' uovo sbattuto. Coprite il tavolo con una tovaglia pulita e infarinatela. Mettete la sfoglia al centro e stendetela con il mattarello. Poi, infilando le mani sotto la pasta, tiratela delicatamente in tutte le direzioni e senza fretta, fino ad ottenere una sfoglia molto sottile (e trasparente). Spennellatela con l'olio o il burro sciolto. Distribuite la frutta lungo un bordo, cospargete con il pangrattato, e poi distribuitevi la ricotta sopra. Ripiegate il bordo della pasta sulla farcia, e poi alzando la tovaglia iniziate ad arrotolare lo strudel. Trasferitelo in una teglia e spennellate con l'uovo mischiato con un cucchiaio di latte (ricordate 1/3 di uovo che avete messo da parte prima?). Infornate per circa 35-40 minuta a 180°C. Lasciate raffreddare prima di servire. E ancora piu buono il giorno dopo. P.S. Potete anche acquistare la pasta fillo pronta e usare questa o qualsiasi altra farcia per creare uno strudel veloce e gustoso. Oh this looks and sounds so good! How cute to have your daughter help out and learn your craft and traditions! Strawberries are my weakness! 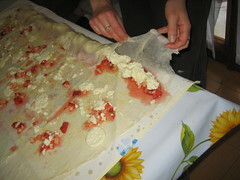 Wow, making your own phyllo?! Holy moly! I can't imagine myself doing that..... Someday if you're in the neighborhood you can stop by and teach me but until then I'll just have to stick to the ole store bought stuff LOL. Your Strudel looks awesome! Oh man! I so want something sweet right now. That looks sooooo good. Thank you for posting. And I LOVE that it's in 3 languages! Thanks Spryte, I wish I could send you some, I'm sure you'd feel better soon. You can imagine how much more work there is translating and writing everything in 3 languages. But then, I found a way to combine my passion (baking/cooking) and my job (translating). Yeah! Grazie, Giulia. Ci sono tante piccole variazioni nelle varie preparazioni di questa sfoglia. Diciamo che tutti ci mettono un'ingrediente che dovrebbe essere la chiave del successo, però io non ci metto ne aceto, ne limone, ne uova, non ricopro la pasta con l'olio durante il riposo e mi viene sempre bene. Secondo me l'unica cosa importante è la farina ricca di glutine, e l'impastare a lungo per sviluparlo successivamente. Anche la consistenza dell'impasto, che non deve essere ne troppo duro (altrimenti se spezza e si creano tanti buchi) ne troppo morbido (perché diventa dificile maneggiarlo).